As we mentioned in our first post How to get started in real estate investing, there are many ways to get to make money in real estate. In this post we look at several of the ways to build wealth via real estate and some of the pros and cons of each. When you think of small mom and pop landlords, you probably think of single family homes. Single family rentals are the bread and butter of many small investors. They can also be a great place to start if you’re looking to slowly build up your wealth to purchase larger real estate projects. Typically these homes are three or four bedrooms with one or two baths, and twelve to seventeen hundred square feet. Some landlords buy their rentals for cash without using any bank financing. Other landlords, buy their rentals using a bank loan. They then use a portion of the rents to pay the mortgage until they ultimately own the rental free and clear. This way, the tenant’s rent helps the landlord buy the landlord’s property. However, those who can purchase a single family home (SFH) for cash, often are able to purchase for a better price. They are also able to keep a substantial portion of the rental income for themselves, rather than paying interest to the bank. Of course, which you choose to do will depend upon your specific situation. The purchase price for SFH rentals is very similar to purchasing you own residence. It is determined by comparing the condition and location with other similar single family homes. This pricing method is relatively straight forward. However, finding a home that is priced right to make a good rental can be a challenge in some locations. Homes in your area may be way too expensive to make decent returns as a rental. To overcome this, some single family investors choose to invest out of state in order to find better returns on their money. However, investing out of state brings it’s own risks. I once heard an investor say he had “invested in 50 states and lost money in 49 of them”. Pros: Single family homes are moderately liquid compared to other types of real estate investments. This means you can generally sell them with only a little effort. They also tend to attract longer term tenants than do multi family or apartments. Property inspections are relatively straight forward and seller is required to disclose all known material deficiencies. Cons: When your single family rental is vacant, your entire source of income for the property also disappears. Experienced landlords know that their single biggest expense is vacancy. As a result, they do everything they can to prevent vacancy, sometimes avoiding rental increases for years to prevent tenants from moving. Multi family homes (MFH) can be duplexes, but usually are three units or more. Prices for MFH are typically more expensive to purchase than SFH in similar neighborhoods, but offer income from multiple units, referred to as doors. If one unit is vacant, you continue to receive income from your other units that are rented. Properties with five or more units lose some of the disclosure protections that SFH have when you purchase them. It is assumed that buyers of multi family properties are not novices to real estate. As a result, it is up to the buyer to do more due diligence. You will need to thoroughly inspect the property, the accounting books, tax returns, rental income and expenses to verify all information. Unlike single family homes that are priced using local comparables, multifamily properties are priced using an income model. Multi family homes are priced based on the income they produce. For example, suppose you have a five unit complex that grosses $5,000 a month in rents and another five unit complex that grosses $7,000 a month in rents. A MFH buyer should expect to pay more for the property that generates more monthly income. The first property might sell for $500,000 where the second property might sell for $700,000. There are several ways of valuing MFH and different investors tend to favor one method over another. Gross Rent Multiplier and CAP rate are common, but each ultimately are dependent on the neighborhood and the cash flow. Pros: When a unit is vacant, the other occupied units continue to generate income. Cons: Can have a higher turnover rate than single family homes. Buyers of properties with five or more units are assumed to be real estate expertise and to do their own due diligence. Sellers aren’t required to disclose all material facts. Vacation rentals have become very popular recently. Companies such as VRBO.com and Airbnb.com allow owners to rent their homes out as vacation rentals. Often, these properties are near popular vacation destinations or cities. Sometimes these vacation properties started as second homes, that the family decided to rent out when the family is not using them. Other properties investors intentionally buy properties with the sole intention of using them as vacation rentals. You also need to be aware of any local regulations regarding vacation rentals. South Lake Tahoe for instance has adopted an anti vacation rental policy. Most cities are also requiring vacation rentals to pay local hotel taxes. If you’re thinking about doing a vacation rental, you’ll want to do plenty of research to determine if it is worth it. Pros: Typically able to charge higher rental rates. Can be very lucrative for destinations where demand is high year round. Cons: Can be very sporadic income due to seasons. May be subject to additional local regulations. You will also be responsible for cleaning after each tenant leaves. Most people are familiar with house flipping from the various television shows. 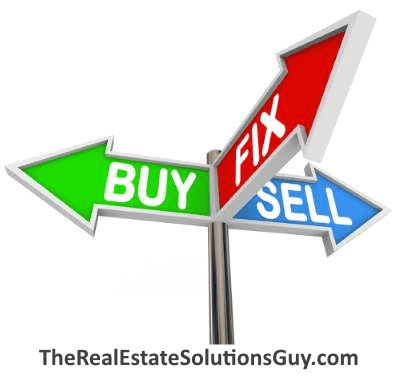 With house flipping, you purchase a property that needs updating or can be improved. You then fix it up and resell it. And hopefully you make a profit. If your only exposure to flipping is reality television shows, it would seem like the you can get rich doing a just a few flips. It looks very glamorous and many people dream of flipping homes, however therein lies the problem. There’s lots of competition to buy run down homes. All you have to do is google “we buy houses” and you’ll find several pages of of people wanting to buy fixers. To add to the difficulty, many fix and flip properties are purchased by general contractors who can complete the work without having to add on an additional profit margin for the flipper. In addition, without experience, many newbie flipper significantly under estimate the time and the cost of repairs or over estimate the value of the homes. For example, I have two friends who are each working on separate their own flips. Currently, they are both well over 18 months in the rehab alone and are not ready to sell. Mike Morrongiello who runs a real estate investing club in Marin County says “Flippers rarely survive in the business long term.” Those who do, have multiple sources of real estate income other than fix and flips that may include rentals or investments. If you want to buy a fixer upper to flip, make sure you get a whole home inspection before you buy. You should also get bids from at least a couple of contractors to get an accurate estimate of what it will cost to fix. Don’t assume you can estimate costs accurately without having some experience. Be sure to also include fees insurance, escrow fees and agent commissions in your holding costs. Pros: Can provide big pay days if you find the right opportunity and the market remains stable. However, flips are like baseball where home runs are rare. Cons: Opportunities are scarce with lots of competition. Very few flippers actually survive beyond one or two houses. Most people think of commissions as the primary income source and reason why people become Realtors®. However, many agents are full time real estate investors. It’s rare to find a broker’s office that doesn’t have at least one or two landlords working as agents. Not only does it give the agent/investor access to the Multiple Listing Service, but they often find deals through unadvertised leads. These leads, often called pocket listings, typically come from other real estate agents in their office or from clients. Pros: Can provide buying opportunities not available to the public. If you have a large network of people, you can also make a good living from sales commissions. Cons: Yearly membership fees. Additionally, very few real estate agents actually make a living based solely on their commissions. Commission income fluctuates with the economy as housing prices and markets change. We mentioned wholesaling in our first post of this series. Wholesalers are people who look for buying opportunities and get the property into contract. After having a signed contract, they then look for other buyers who are willing to pay more to buy their contract. Wholesalers ultimately never buy the property, they simply act as a broker between parties. Many of the no money down real estate seminars teach this method. This method can lend itself well to someone working part time or with little money. However, I would recommend that you don’t attempt wholesaling unless you have owned a few rentals or flipped a few houses. I get leads regularly from wholesalers, however, I rarely see a wholesale deal where the numbers are accurate. The estimated after repair value (ARV), or resale value is often inflated and the repair and holding costs are under estimated by several thousand dollars. It my personal opinion that you have to write a few checks for repairs before you can begin to accurately determine what it will really cost to make repairs. Walking the aisles of your local hardware store is not enough. If you took one of those weekend seminars and want to be a wholesaler, can I make a suggestion? Skip trying to call every investor in town to see if they want to be on your buyers list. Instead, find a good deal, get it into contract and then call three or four local investors to see if they want to buy your contract. Spend your time looking for deals instead. Pros: Good for part timers. Cons: Difficult to get accurate estimates without real world experience. Even more competition than there is with house flippers as there’s a seminar every week teaching this model. Want to manage other people’s rental units and not have the expense of purchasing your own rentals? Consider becoming a property manager. Property managers are the primary contact for tenants when there’s a problem. They also collect rents for the landlord as well as screen prospective tenants for the landlord. Fees for property management vary. However, it’s not uncommon for them to charge ten percent of rent each month and the equivalent of one half to a full months rent every time they rent up a vacant unit. Many times they also perform all of the property maintenance and repairs for the landlord. Of course, they also add a markup for the repairs. Pros: Can provide access to buying opportunities to buy properties from tired landlords. In California property managers must be licensed real estate brokers and therefore can also be the Realtor® for landlords selling their rentals. Cons: Property management has hundreds of rules and regulations, and often named in lawsuits. That’s the first seven ways to make money in real estate. Next post we’ll talk about more advanced methods using options, lease options, mobile homes and notes to make money in real estate.